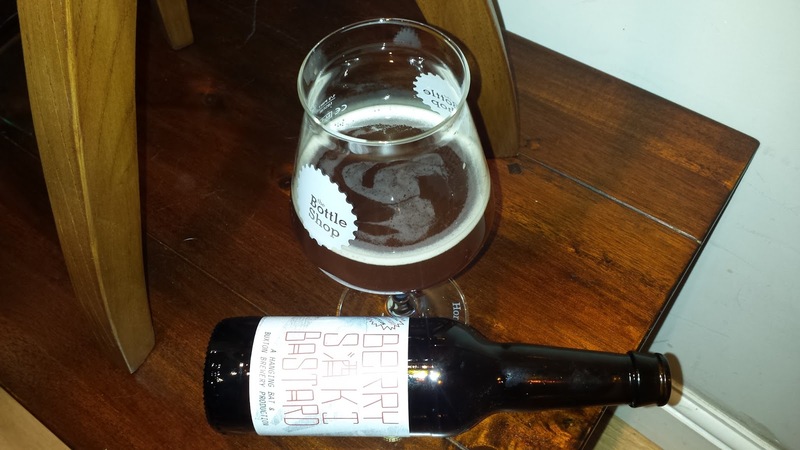 Into The Unknown part 2 – MostlyAboutBeer……..
As a nation, when it comes to food and drink we have been both deprived and overwhelmed. The deprivation came firstly from the success of the industrial revolution. Industrial methods of containing, packaging and preserving food meant that tins, jars and packets could be sent to the four corners of empire shadowing the spread of industry across the globe itself. As a side effect, this safe but bland staple gradually eclipsed the British understanding of cookery as it had been known just a generation before. It was a method of keeping huge and far flung population chains going. Secondly, rationing during and after the Second World War lasted longer in Britain than anywhere in Western Europe. It finally ceased in 1954 after a span of nearly fifteen years. Home cooking had long become dependent on tinned, hermetic and powdered goods. In the new chrome post war Britain, sterility ruled. Breast milk for babies was out and formula mix in. Our national diet veered from overcooking combinations of flour, lard, milk, spuds and peas to the one available cheese made from fat and salt – to the horrors of corned beef and spam to the hallucinogenic rush from intakes of Tate & Lyle sugar, Bird’s custard or Hartley’s jam. Continuing into the unknown, the beers is this 2nd article celebrate the the loss of homogeneity and the rediscovery of pleasure in Britain. For readability, the beers have been put under 2 headings though in reality each glassful is as unique as the next. Water, malt, yeast and hops. These are the four ingredients for beer. The hop is the latecomer in the quartet. It was popular in Bavaria long before it came to Britain. The Dutch finally introduced us to it in about 1400 and neither us nor the rest of the world has looked back since. Countries like Belgium have been adding the fifth ingredient for hundreds of years in the form of cherries, apricots, coriander or orange peel. In Britain, we’ve been more staid with our breweries. Mostly, our beer quenched the indifferent thirsts of workers of the industrial age. It was about quantity though some spices or added sugars may have found themselves into some Christmas brews. The following beers commemorate the magic that can be brought about by experimenting with that extra ingredient. Siren is of my favourite and most experimental breweries. I love the fact that their beers can be found on cask, keg and in bottle and stride the whole ABV spectrum. 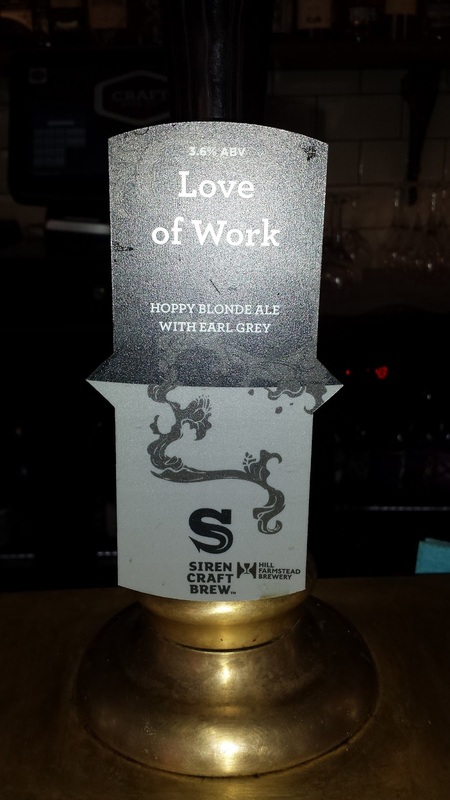 I found Love of Work on cask in the Craft Beer Co Covent Garden. Added ingredients are all the rage but tea should really be given serious shrift when combined with hops. When I raised the glass to my lips, I realised that both tea leaf and hop cone are subjected to a similar process to achieve the same result: Both are immersed in hot water to release the oils in the flesh. Also, each can be considered a relaxant. In fact, hop tea is becoming popular as just that. Tea leaves contain L-theanine – linked with reducing mental and physical stress, improving cognitive performance and lowering blood pressure – ironically joining in a tug of war with the alcohol pulling in the opposite direction. The end result is actually a kind of tea or tisane containing Earl Grey leaves and Amarillo, Citra and Centennial hops. Thinking about it, they seem more natural bedfellows for the tea than adding fat rich milk from a cow’s udder and a teaspoon of refined sugar. Love of Work is a pale glowing golden with a dappled white head. It smells as though there is a squeeze of lemon. It’s light, crisp and peachy with the tea working its charm on the inhale. I’m reminded of a toned down Vicks Vapour Rub. It has a calming effect on the drinker. Some people add a squeeze of lemon to their tea ‘cause it brings out the tea’s flavour even more in the same way seasoning meat with salt brings out the flesh flavour. It’s a lovely beer – the malt and the hops react on the back of the palate whilst the high zingy note resonates at the front. With regards to whether there is a fruity, dry or bitter aftertaste, it just seems to wash itself away – a clean aftertaste. Actually once you’ve drained it – quite soapy. The Foragers is the alter ego of a pub called the Verulam Arms in St Albans. Customers are taken out on foraging missions to the local countryside and return with the spoils. These are then cooked and served up. Recently, they installed a small brewing kit in the garden and cask their own ale as well as cultivating their own hops up a trellis on the back fence. Their skills of flora and fungi identification mean that unlike most people, they know the flavour profiles of things like yarrow, coltsfoot, common inkcap, wild Douglas fir, Lady’s smock, hogweed, sheepsorrel, ground ivy and mugwort. They take this knowledge and apply it to ale mixology to produce some of the most bespoke and locally sourced beers there are (1). They made an oatmeal stout brewed with sweet woodruff – the same plant added to the green Berliner Weisse (Berliner Weisse mit grunem Schuss). After I’d had the stout I tried some of the woodruff syrup made on site. It’s used to make cordials or added to spirits. The hit I got from the glass was overwhelming and contradictory. One plant I can identify in hedgerows is Garlic Mustard or Jack of the hedge. You can eat the leaves and they do taste and smell of acrid garlic. A cloud of it buffeted me along with an intense sweetness like the iodine in cough mixtures. On the palate it tasted of undergrowth, undilute Ribena and chlorophyll. How often do you get that in your beer? In the beer though, it was a milder story: It tasted of sweet chocolate powder and had that aroma too. Light mocca froth. Gentle carbonation. It was a bit like drinking a crunchie bar complete with the tangy orange grouty filling. There’s also something soft like vanilla petals. Malty mouthfeel. Leaves a decent dry coffee cake aftertaste. Oliver’s Island protrudes from the Thames and is visible from the brewery in Chiswick. Fullers always has a seasonal but they also bring out beers to outlast the season and become semi-permanent. This beer replaces Discovery and should end up being available all year round though starts off very well as a refreshing spring/summer ale. I include it here not as a revolution in brewing but as a palate cleanser roughly halfway down the list. 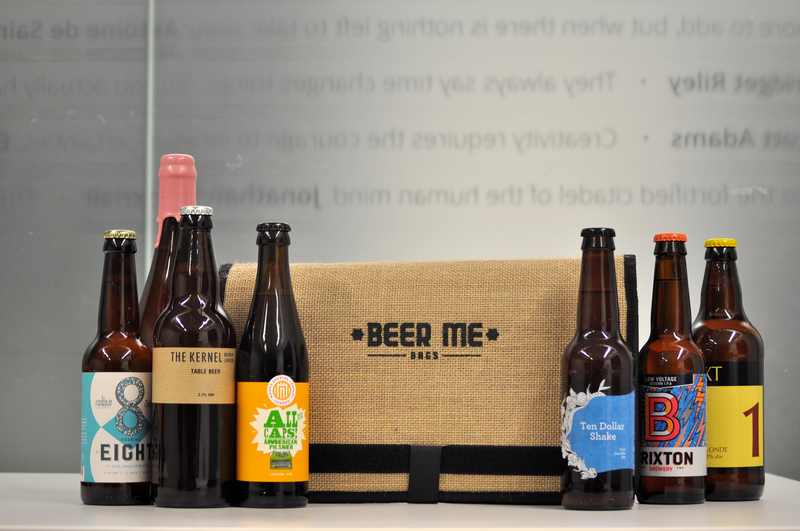 It’s also here to provide some relative ease in an article featuring challenging beers. It’s really here though, because I love the beer and it’s new. Adding orange peel to British ales isn’t pioneering but I’ve never knowingly drank a pale/golden ale/bitter with the addition of orange peel. It contains Goldings and Liberty hops – the latter are related to (and come from) Hallertau hops used for aroma. When you also add the fact that wheat is used in the mash, this is obviously inspired by the continental witbier tradition (2). It’s light golden amber with a rocky white head. Despite it’s spiritual similarities with Wit – the liquid is crystal clear. Marmalade/peachy aroma. First taste is of citrus zest. Marmalade and apricot continues on the palate. It’s a bit like devouring a handful of easy peeler tangerines. There’s enough malt in the body to transform this from a session beer into a nectar. The orange peel provides the high summery note all the way down the pint. Writer Melissa Cole helped Fullers come up with the recipe and I think it delivers. This could so easily become a preferred session beer for thousands and can be equally enjoyed by drinkers of cask ale, lager or witbier – incidentally, all three are usually available in Fullers pubs so could easily stand in for that pint of Chiswick Bitter, Frontier Lager or Blue Moon should those lines run dry. It’s clever from every direction. Fullers has been brewing for 170 years now and has both been the maintainer of tradition and a hub of innovation. Its Fullers Reserve series – high ABV beers bottle conditioned and aged each year from a different recipe – now goes back almost 20 years to 1997. Since that time Fullers has seen countless breweries shrink back to a core beer before disappearing completely or being absorbed into a huge portfolio as the breweries ingested each other like Russian dolls. It’s still pushing out the effortlessly tasty as well as providing the challenging. It’s one of the few giants keeping apace. The best beer for me is one that doesn’t sit neatly within a style. Traditionally, a beer style whether it’s a bitter, saison, mild, wheat or rye beer only became a style through conformity and the restricted availability of local ingredients or the established import of others. I believe we also have a tendency to look at what is or was common and see this as a rule to regulate following beers. Originally, it may have been brewed that way through simple expediency. We categorise beers because it’s necessary to get a basic vocabulary. With that, you can then have a conversation. So far so good. When I pick up a bottle in a good beer shop and it has beautiful illustration but no defining words, I too ask “what kind of beer is it?” in anticipation of the answer containing at least one familiar term. Deep down though, I know that the simple answer will still leave the beer’s character unexplained because even within the restrictions of that term, the experience could go a thousand ways. That’s the beauty of the alchemy at the heart of beer. It’s not just the ingredients, it’s what the brewer – through their vision or by simple fluke – has transformed them into. With the three following beers, “what kind of beer is it?” can only be answered by “how much time have you got?”. Like Fullers, the Halve Maan (the Half Moon) or Maes brewery is an institution that keeps up with modern trends. As an institution, it goes back a lot further than its Chiswick cousin. The original brewery dates all the way back to 1564 but was acquired by Leon Maes in 1856. At the time he visited England to find out more about modern brewing before setting up a hop kiln and malt house back in Bruges (The newly merged Fuller, Smith and Turner would have been just over a decade old at the time – it would be amazing to discover he visited ). This twist on their Tripel lobs a grenade into De Halve Maan’s own traditions. Tart beers be they Flemish Reds or Lambic help define Belgium. Now it’s only after the popularity of Brettanomyces has circumnavigated the entire globe that it finally returns to explore the crannies within idle reach of whence they sprang! (4) This is testament to the international buzz of collaboration and experimentation, but also to the massive diversity in beer from such a small country like Belgium. It’s taken the whole world to make a North West Flemish brewer take just one step into its own back yard and nearby Pajottenland – home of Lambic brewing – to look for inspiration. This is the world of regional and international brewing distorted through the prism of a carnival mirror. Straffe Hendrik Tripel is refermented with Brettanomyces and aged for 3 months before the beer is released. It’s a beer that should also be laid down (meaning stood up) to age for years. It pours a glowing light copper. There’s a pale hop oil constellation on the surface. The aroma instantly betrays the beer’s secret – that it’s strayed from its roots. The sour pungent Brett aroma is almost like uric acid – it wheezes into you. Once the liquid trickles down the gullet though, the original Flemish Tripel sweetness is still there. There’s candied apples and a touch of Cognac. However, almost in the way of a British bitter, an evening out of characters is achieved – the sweetness is lifted – and to some extent neutralised by – what would be the eye watering Brett. At 9 %, the beer delivers a happy warmth. New Zealand hops are becoming very popular – even outshining American hops. They enjoy a golden and very specific terroir. The tastes and aromas are typically like a Carmen Miranda fruit basket. 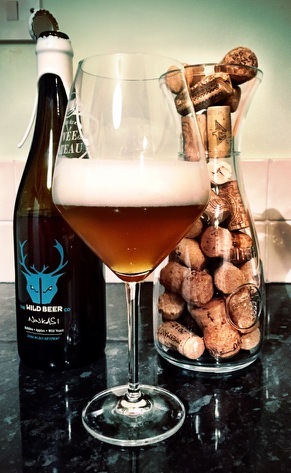 Like sours, Britain is also becoming more and more acquainted with wild beers – these are beers seeded spontaneously by wild yeasts in the atmosphere and can be hard to achieve. If it’s a sideline rather than the main output, even if it works it needs to be well away from the regular brewing kit as the cultivation of wild yeasts will end up finding its way unbidden into the bottom or top fermenting beers. If these points weren’t enough for one beer than consider this – fresh Somerset apples have been added to this and the beer is undergoing a secondary fermentation in the bottle with Champagne yeast! This beer gets its name from the Sumerian goddess of beer and Alcohol. It pours dreamlike into the glass – a cloudy golden yellow. There’s a lily white hop oil swirl on top. The aroma is funky and lends itself mostly to the apples -masticated juicy white apple flesh. The mouthfeel is silky and I can feel my cheeks going red from the brandy like warmth of the alcohol. It feels like a cross between beer, cider and brandy. This beer contains an unbelievable combination: Sorachi Ace hops, Saki yeast, raspberries and white wine. Pours a Flemish style red burgundy. Creamy milk of a head. The aroma is tart like a fruit coulis – the raspberries come through but are soured further by the white wine. It may be the saki yeast. The nose is a red fruit balsamic. The taste is softer than the nose suggests like the top red layer on strawberry cheesecake. There is a touch of Rodenbach about it with a tangy carbonation that really lifts the beer – it doesn’t come over as 10%. The mouthfeel is creamy. I get notes of red wine rather than white. The taste fizzes on the roof of the mouth. It warms up as the alcohol starts to glow. Despite this glow – it’s fruity and refreshing. The white wine only comes out on the burp (subtly undertaken of course). It’s a cocktail! The more you drink it, the sweeter it becomes. Modern brewing throws hundreds of darts at a board to see which, if any, hit. In truth, even the ones that find it don’t stay in for long. To me, it’s a testament to passion that big breweries are needing to keep up with small capacity guys leading the innovation. It seems as though every big established brand is hastily erecting an Ikea shed around the back to set up a micro and brew something radically different from what’s being sluiced into the bottle plant at the front. They’re hedging some bets on their own future – to mimic is to survive. It’s difficult to tell whether our current beer obsession is part of a larger food revolution. The need to reacquaint ourselves with flavour and raw ingredients seems intuitive but this hunger for the alchemy of brewing isn’t limited to us. It’s been hugely influenced by the U.S and is reflected in Scandinavia, Canada, Australia, New Zealand, Italy, Holland and now Spain too. Their dietary backgrounds have not been the sepia culinary woes of Blighty – yet we’ve all now find ourselves on the same journey. Whatever the reason for this modern day St Vitus’ dance, it’s international, forward geared and draws on, but is unrestrained by tradition. We should just celebrate the fact that it’s here. 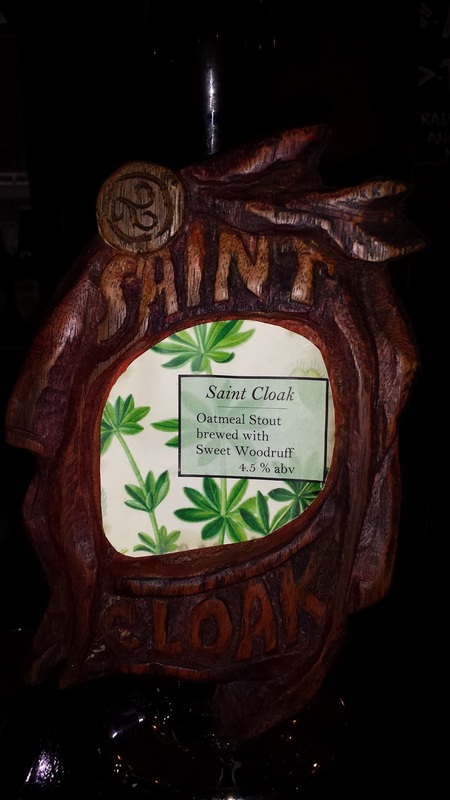 1 – A note on the beer’s odd title – it refers to Saint Amphibalus. Saint Alban (after whom our city is named) is Britain’s earliest saint – he was executed by the Romans in the third or fourth century. He himself had been converted by a priest who needed shelter from the Romans. To protect him, Alban went out dressed in the priest’s clothing and was apprehended. History has not recorded the priest’s name – Ambhibalus is Greek for cloak – the item of clothing which Alban donned so his saintly title was back engineered from that. Amphibalus was made a saint hundreds of years after St Alban – a kind of ancillary saint to help bolster the city’s thriving pilgrimage industry. Two saints for the price of one! As you’ve read this far – one more colourful detail – according to the (ahem) legend – when Alban was beheaded by the Roman, the executioner’s eyeballs popped out of his head and either landed in his hand or rolled down the hill with Alban’s head. This is not only illustrated in stonemasonry relief on cathedral walls but commemorated each year when two school children dress up as or carry giant eyeballs on poles in the annual St Albans day procession. 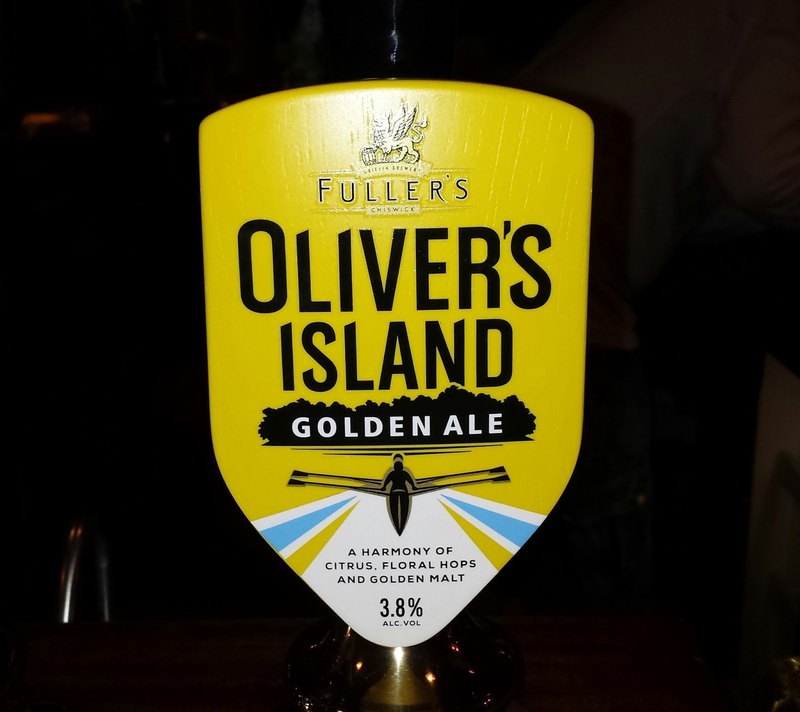 2 – The same ingredients used to make Oliver’s Island also seem to be in the recipe for a celebration ale commemorating Fuller’s 170th anniversary. That beer has a heavier 7% ABV. 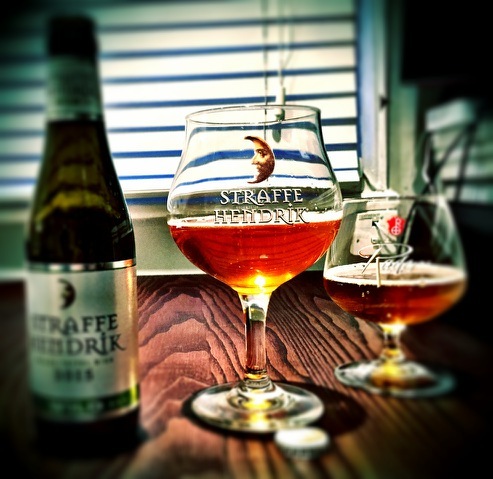 3 – Straffe Hendrik means Strong Henry. It’s a dynastic title the family has kept going ever since Leon Maes. Each male inheritor is the new Henry. Currently it’s Xavier Vanneste who should qualify as Henry 5th. 4 – Actually Brettanomyces means “the British yeast” and is found all over the world. In contemporary times though, Belgian beers have been the influence behind the popularity in America and now Britain. One strain is inspired by Belgium though – Brettanomyces bruxellensis.